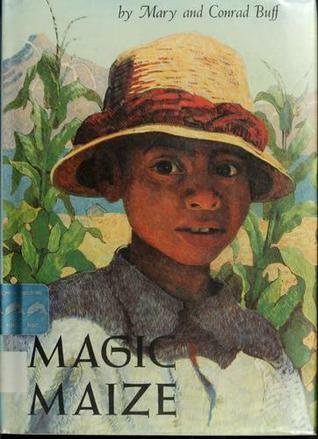 Magic Maize is a short novel about Fabian, a Maya boy in 20th century Guatemala who is caught between his father's love for the old ways and traditional Mayan beliefs and his peddler brother Quin's sympathy for "gringos" (white people) and his willingness to accept the supposed superiority of the white man's brand of maize. As Fabian struggles to reconcile these two opposing worldviews, he grows some of his brother's "magic maize" in secret and also discovers a rare jade earplug that he does not realize may lead to good fortune for his whole family. This book gives the young reader a bit of insight into the Mayan way of life and the tensions between the Mayas and the white Spaniards. Unlike the Goodreads reviewers of this book, I did not find the authors' treatment of this subject matter to be inherently racist. For the most part, in fact, the attitude of the story is fairly neutral toward the Mayan belief system. It is clear that Fabian's father sincerely believes in the prayers and rituals he performs before planting or harvesting his maize, and though the book ultimately introduces other ways of doing things, it does not ridicule Fabian's parents and neighbors for the way they practice their religion. Fabian and Quin seem to decide - and to convince their father - that perhaps not all new ways are bad ways, but there is nothing overt to suggest that they do this by abandoning their entire way of life. "I know, I know," answered Quin, "but I see many things as I carry bananas from the jungles to the highlands and maize from the highlands to the jungle. I have known many kinds of people, Fabian, and now I know that they are much alike. Whether they are Indians or gringos, they are alike. Some are good, others are bad. But most of them are neither all good or all bad. It is easy to see why Father hates the gringos. The Spaniards were cruel to the Indians for as long as anyone can remember. But those days are going." I much prefer this message over the simplistic contemporary notion that to be white is to be evil. Honestly, those who push for diversity in books because it exposes readers to many different types of people and situations ought to appreciate Quin's realization that the diverse people he meets show him how very much alike all human beings really are. I thought that was the point. In any case, I don't see the value in excoriating authors of old books for not writing according to contemporary standards, and I'm tired of feeling like I need to become an "old books apologist" in every review I write. This book is over 60 years old, and it is a product of its time. If I think of it that way and ignore all the politics of children's book publishing in the 21st century, I can say that it is well-written, makes great use of storytelling as a device within the story itself, and teaches young readers about a culture and time period with which they may not otherwise be very familiar. I also like the sepia-toned illustrations, many of which take up full pages, and all of which help readers to picture and contextualize what is presented in the text. I will admit that the story was a little bland for me, but I would still not hesitate to share it with my kids. It's interesting, memorable, and well-written, and to me, that's really all that matters.